This shark-like beastie is know as the Zamtrios! It’s the only fourth generation monster to get its own minions. Read on to hear more! The Zamtrios is a shark-like Amphibian with light blue skin encountered in the Frozen Seaway. It has its own minions, known as Zamites, which come in a couple of different sizes. The tiny ones are absolutely adorable, especially when they latch on to you like a Giggi and leech your health so they can grow. In the cutest way possible. You can see an itty bitty zamite off to the left. 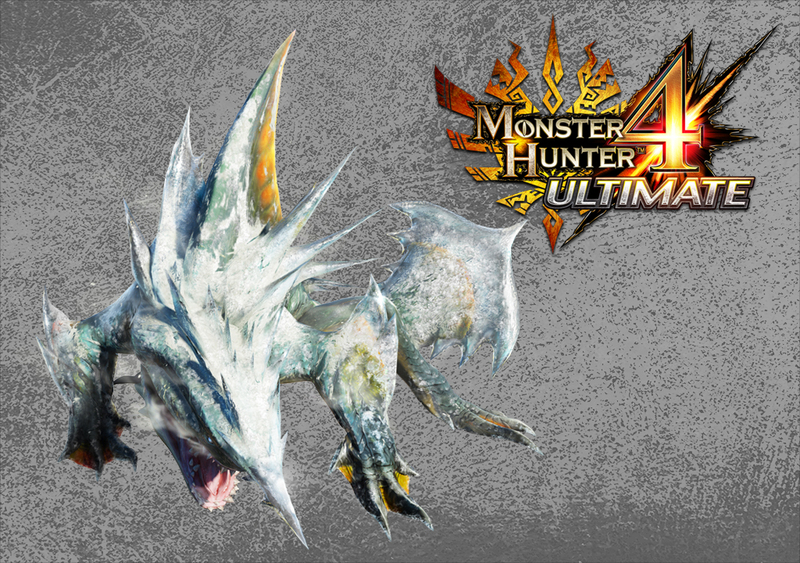 The Zamtrios is capable of inflicting both ice- and waterblight, though the latter is uncommon. 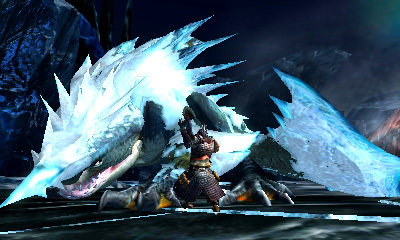 It deals ice damage with a number of its attacks and is weakest to fire and lightning. Given the choice, I’d recommend a fire weapon for reasons discussed below. Its breakable parts consist of its face, tail, dorsal fin and hind legs. Being an amphibian, the Zamtrios is able to swim, and it can do so through the ice of the Frozen Seaway. When it’s underice, it’ll swim under the hunter, which will make them shake, before leaping up through the ice for a powerful attack. I’ve yet to be hit by this attack, as rolling at the correct time in the right direction will allow you to easily dodge the leaping attack completely. Also while it’s underice, its fin will be showing. Throw a sonic bomb at the fin when it appears, and the Zamtrios will be exhumed so you can land some free hits. 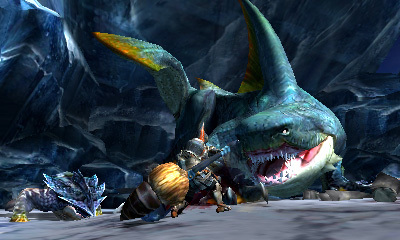 The Zamtrios has a technique in which it will sit for a few seconds, watching the hunter move. It will then charge forward to attack, so make sure to keep an eye on which direction it heads off in. It’s also capable of lunging forward and grabbing a hold of the hunter in a pinning attack. 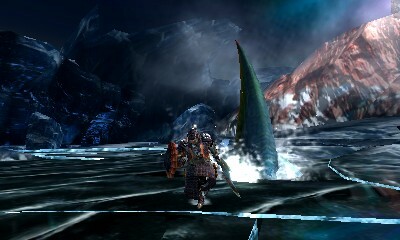 An enraged Zamtrios, tracking the hunter’s movements. 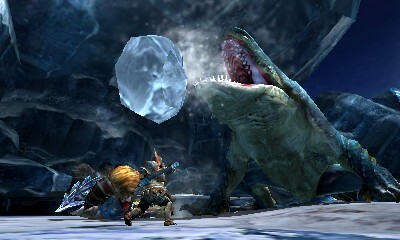 When the Zamtrios gets enraged, it excretes a fluid which then solidifies and coats it in an armour of ice. This ice can be melted using fire weapons, which is why I recommended them in the second paragraph above. It can also use this excreted fluid at any point in the fight to puff itself up and try to squish the hunter by jumping or rolling all over them in one of the silliest displays I have ever seen. While inflated like this it may open its mouth wide and spit out globs of fluid for several seconds. These can also be spat at will in regular parts of the fight, and will inflict snowman if they hit. While it’s doing this, I’ve found it an effective strategy to run up behind it and attack it from there; I’ve rarely, if ever, gotten hit by a glob while I’ve been there, and almost always managed to get off a couple of XXXR hammer combination attacks. It’s also a great way to break the tail and hind legs. If you’re wondering, yes, it can be killed while in this puffed up state, so you end up carving this ridiculous inflated mass of shark. And no, it doesn’t net you extra, carves, unfortunately. After it’s done being a puff ball, the Zamtrios will literally begin to deflate. Air will blow out of it from all sides, making it impossible to approach at this time; getting hit by the frigid air will give you iceblight. 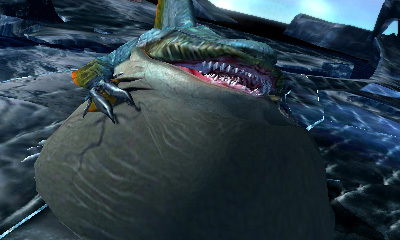 The Zamtrios is probably one of the weirder of the new monsters, largely because of the way it can inflate itself. Check back next week for the Najarala!